The Salesforce VetForce team and Slalom Consulting are proud to announce that the new VetForce community is live! 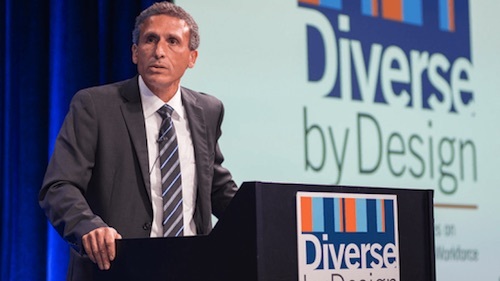 The community combines ideas and feedback from hundreds of veterans to deliver a holistic learning experience that addresses critical gaps in the veteran's training, certification, and employment journey. 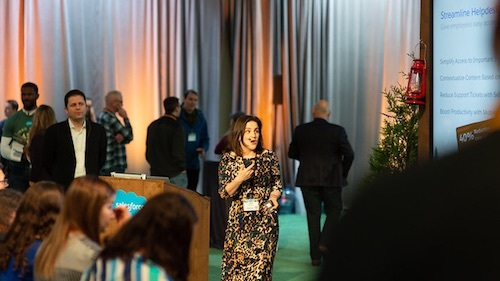 The redesigned community includes game-changing features, such as relating skills and experience from military service to civilian careers, career-specific learning journeys, immersion in Salesforce Trailhead trails, business skills training, partnerships with the Developer and MVP communities, a veteran coaching program, robust job prep resources, and employer engagement with Salesforce customers and partners. Our structured self-paced learning journeys include free online and in-person Salesforce training (Administrator, Business Analyst, Developer, or Sales Account Executive), community collaboration, Salesforce certification, and employment connections to customers and partners in the Salesforce ecosystem. The project would not have been possible without the incredible support of Slalom Consulting, and the result is nothing short of outstanding. Slalom donated over 1,200 consulting hours and staffed an awesome PM who led an expert team of Salesforce developers, BAs, UI/UX designers, and their top technical architect. 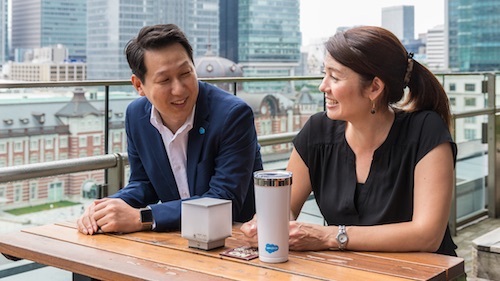 The project took only three months from design to launch, and is the direct result of creative solutioning, agile development, and a very well-coordinated effort between the Salesforce and Slalom teams. The new community reflects our continued investment in supporting veterans, and along with the VetForce program and our VSO partners, paves the way for our most successful year ever. We are committed to delivering a program that creates unprecedented success for the veteran community and transforms the lives of 40,000 veterans and their families. Thank you to the many Salesforce employees, partners, and veterans who helped us build and evolve this community into what it is today. Our success is in large part due to the many individuals and organizations who helped launch this program from the very beginning. A huge thank you to Veterans2Work for helping us launch in our earliest days and for your ongoing partnership, and to VetsinTech and Veterans Workshop who have been with us every step of the way to deliver in-person training cohorts for Veterans. 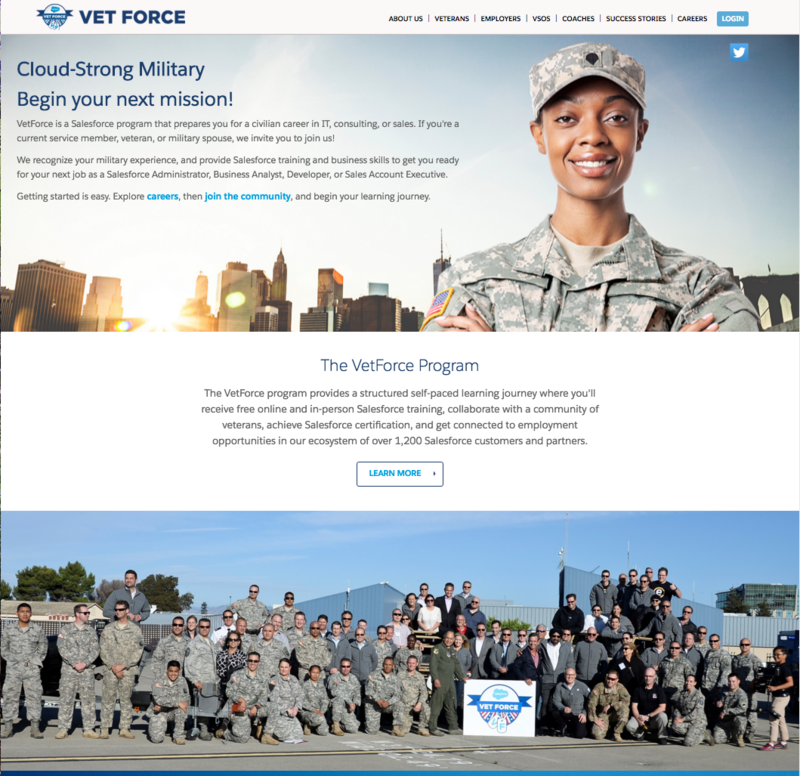 VetForce is a Salesforce program that prepares current service members, veterans, and military spouses for civilian careers in IT, consulting, or sales through career-specific learning journeys on the VetForce Community.